New Delhi :India’s leading manufacturer of TVs and electronics, Super Plastronics Pvt. Ltd. (SPPL), a Kodak brand licensee, announces the launch of its new Kodak XPRO series. 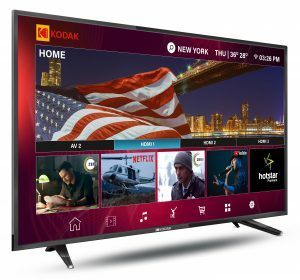 The company has introduced two new models under the series namely Kodak 32HDXSMART XPRO and 40FHDXSMARTXPRO TVs.Coupled with an impressive array of features, the all new Kodak XPRO series comes equipped with Quad Core 1.5 Ghz, a 1 GB memory and flash storage of up to 8 GB.